Now that I have discovered the wondrous nature of fresh, handmade pasta, I feel that it’s necessary to tackle some new dishes – and some old favorites – using this new gift. 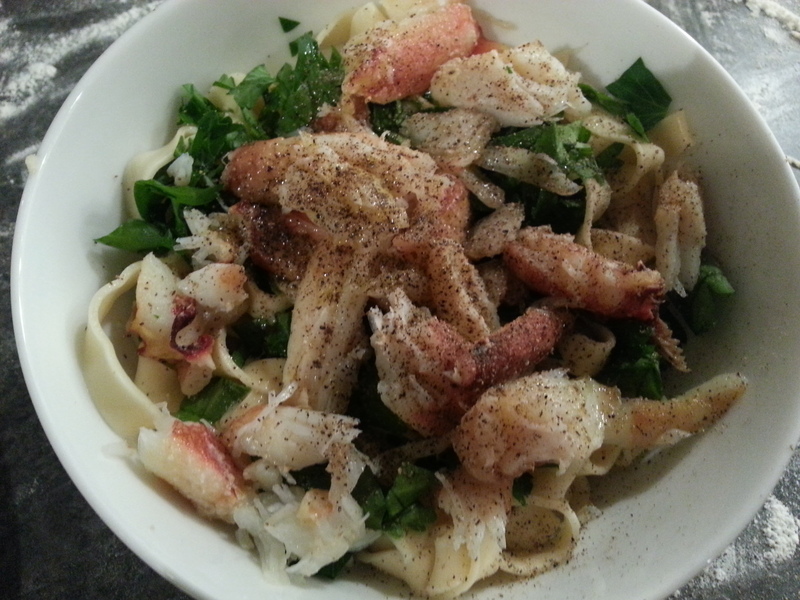 My first foray into this world was a simple old standby: pasta with olive oil, parsley and crab. Now, my wife and I have made this recipe many times over. Given our supply of crab from our summertime forays to the cabin, and my love of pasta, it was only natural that we find a simple and delicious way to combine the two. This is a simple and straightforward recipe. Cook the pasta and (if necessary) pick the crab from the shells, and rough-chop the parsley. Once the pasta is finished cooking, reserve 1/2 cup pasta water, strain the pasta, and mix with the crab and parsley. Salt and pepper to taste. The natural flavors of the simple ingredients should be enough to compliment each other. You may want to add a small squeeze of lemon to give the dish a little citrus zing.